Back in our day, we broke our arms, fought bandits and suffered from dysentery...up hill...both ways...barefoot. Long before the likes of 3D graphics and "blast processing", there was The Oregon Trail, a delightful PC game that chronicled the harrowing trip from Independence Missouri to Oregon, circa 1848. You're in charge of a wagon and tasked with not only keeping it in one piece, but also managing resources and caring for your party. Along the way, bandits, bears and other annoyances make life difficult, and decisions you make determine whether you safely reach your destination or perish from cholera. Now the classic is reborn on cell phones, courtesy of Gameloft, and new spins on the old formula make it an ideal companion on road trips. Before conquering the Midwest, you must first select your difficulty (Easy, Medium or Hard) and one of three professions. A Banker has the most money, letting you easily purchase medicine and other supplies. The Carpenter, on the other hand, is a master of wood and his wagon deteriorates slower. Finally, the poor Farmer's food supply decreases slower than the other two, simply because he's broke. These differences add replay value to the experience, as you'll want to experience things from all perspectives for new challenges. From there, you choose your wagon (standard, deluxe and reinforced), make small talk with the wagon leader (this functions as the game's tutorial) and then you're off, blazing a trail through the wilderness. For the most part, you watch your wagon and party members forge onward against attractive backdrops, such as a forest or desert. You can speed them up by hitting the four key, but doing so decreases both your food and wagon strength. When either depletes, you can replenish food and make repairs with enjoyable mini games. 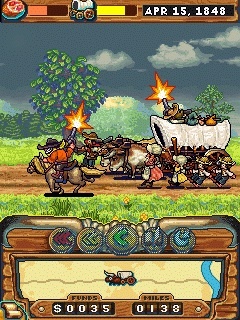 Gathering food involves walking into the forest and shooting animals, including squirrels and rabbits, placing a cursor over the creature and pressing the five key to blast it and collect its meat. As for repairs, a bunch of nails scroll across the screen and you must line them up with your hammer and hit the five key to drive them home. Those are not the only games, however. In addition to hunting and hammering, you'll also guide your wagon across rivers, picking up gold coins and dodging obstacles. While on your journey, you'll face numerous hazards. Party members can contract a disease at any moment, as well as break bones or suffer bear, bandit and snake attacks, forcing you to make critical decisions. Do you fix that person's arm or continue onward? Should you look for medicine to cure the little girl with dysentery, or wait until you hit your next checkpoint. Be careful what you decide, as the slightest misstep may prove fatal. There's also random occurrences to keep things interesting. Pressing the five key at certain moments presents you with a task or even a reward. You can agree to deliver a package, give a hitchhiker a ride for cash or trade supplies with others for food. It's up to you. All of this amounts to a cool strategy game that's great in short bursts. We say that because The Oregon Trail isn't long, and before you know it, you'll reach your destination hungry for more. You can replay the game multiple times, but it's not long before you've seen all that it has to offer. Even worse are the load times, which are strangely long. While waiting, however, you can review your stats (miles traveled, days traveled, pace, health and remaining party members) and the game offers several facts. In case you don't know, there are two oxen in a yoke (wow) and children collected buffalo poop for fuel (you don't say). It's a shame, because we wanted a meatier adventure, but Gameloft streamlined it for cell phones, and despite the colorful visuals that really pop off the screen, we can only watch a wagon roll across the screen for so long. 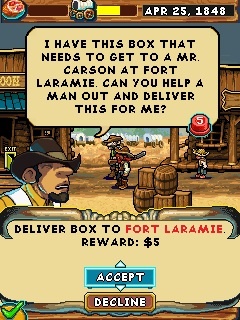 That being said, we appreciate The Oregon Trail for being different than the usual sports games and shooters. It's a neat classic revival and a trail worth taking. What's Hot: Enjoyable coin collecting and animal blasting mini games, attractive nineteenth century scenery and rabid squirrels. What's Not: Slow load times, doesn't take long to reach Oregon.